Tweedsmuir Kirk stands in the tiny scattered settlement of Tweedsmuir on the A701 some 14 miles north of Moffat in Upper Tweeddale. To reach it you turn off the main road, cross the River Tweed, then take a left at a crossroads along a lane which brings you past the church to the car park. South and east of here is some of the most remote countryside anywhere in Scotland, and the single track road that starts at Tweedsmuir and passes the Talla and Meggert Reservoirs en route to Cappercleuch is the perfect antidote for anyone who thinks that the best bits of Scotland are all in the highlands. Tweedsmuir Kirk is visually very attractive. In part this comes from the contrast between its grey rubble walls and the extensive red sandstone dressings, and in part from the interestingly shaped tower which immediately grabs your attention. But in many ways the most striking thing about the kirk is its location, on top of a small rocky outcrop on a tongue of land passed by the Talla Water to its east and the River Tweed to its west. This is the sort of raised site which can indicate many generations of earlier churches in the same location: though in this case that is a misleading impression and only one earlier church previously stood here. The surrounding kirkyard extends beyond the outcrop and there are gravestones dating back as far as the 1700s; plus a Covenanter's monument erected in 1726 memory of John Hunter, killed by a government dragoon in 1685. The first thing that takes your eye when you enter the church through the door in the foot of the tower is another memorial. 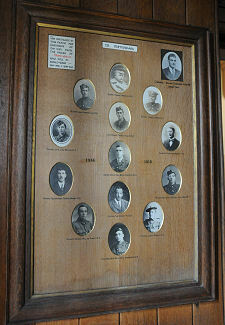 There are reminders of those who fell in the 1914-18 and 1939-45 wars in just about every church in Scotland, but nowhere else have we seen one carrying photographs of all the men who were killed. The effect is incredibly poignant. The main body of the kirk is bright and airy, and rather broader than you expect from the exterior. 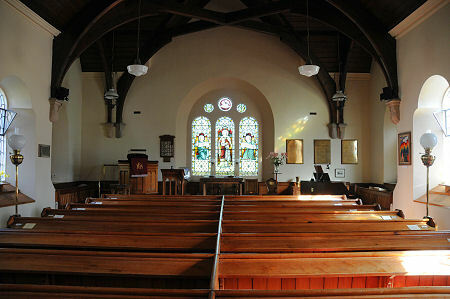 The dark wood of the ceiling contrasts nicely with the whitewashed walls and the more honeyed tones of the pews and other fixtures and fittings. Perhaps the most striking thing about the interior is the quality of the light passing through the many stained glass windows. These come as single, twin and, at the north east end, triple panelled windows, and there are also some circular stained glass windows high in the walls. 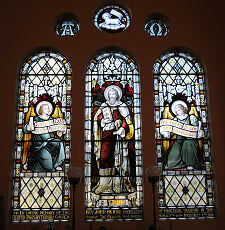 The east window depicts St Paul accompanied by two angels. 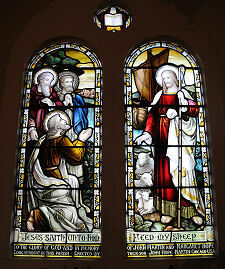 A window in the north transept shows Jesus telling Peter and two other disciples to "feed my sheep". 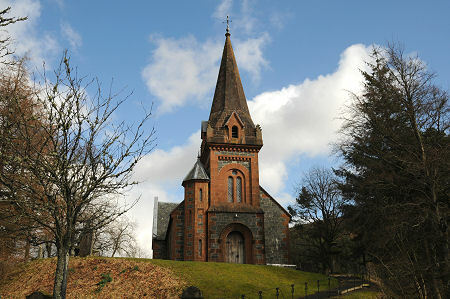 The kirk was built to a design produced by the architect John Lessels between 1874 and 1875. By the late 1900s the building was suffering from water penetration and was in an increasingly poor state of repair. Funds were raised from many sources to allow a complete restoration of the building which began in October 2000. Over the course of the following year a great deal of work was done within an external (and at times internal) cladding of scaffolding and polythene, and the Tweedsmuir Kirk as you see it today emerged in late 2001. The kirk completed in 1874 was the second to stand on this site. The first was built in 1648. This was a simple rubble-built oblong structure with an external coat of harling which would then have been limewashed. There is a print showing this first church on display in the current building: though presumably the title "Tweedmouth Church" was a typo by the printers of the book in which the illustration originally appeared. Fairly extensive work seems to have been undertaken on the first church in 1662, because this is the date on a datestone on display in the kirk. Attending services in the church in its early days could be a challenge. The Tweed was not bridged for well over a century after the church was built, and after heavy rain it could be impossible to ford either the Tweed or the Talla Water, leaving the church virtually cut off from much of its congregation. The conflicts within the church and wider society of the 1600s did not leave Tweedsmuir unaffected: witness the Covenanter's memorial in the kirkyard. And in 1688 the minister, the Reverend Francis Scott, refused to embrace Presbyterianism and was ousted by his parishioners. He left, but took the only keys to the church with him, forcing the new minister to conduct his first service in the Crook Inn. By the early 1700s there were already reports of the church being in poor condition; and the manse was little better. On one occasion it took 6000 divots of earth, 200 rafters and 80 sheaves of thatch to reroof the latter. The structure of the church was again giving cause for serious concern by the 1860s, and this led to the building of its replacement a decade later.